"What would my higher self do?" is a question that Brooklyn artist Bunny Michael poses daily on their Instagram. Michael's brand of self-help is practical, playful, and never cloying: the key to personal growth, their posts stress, is perspective. 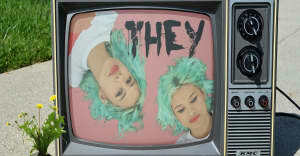 They talked about that more in an interview we did back in the winter of 2016, and now they've brought that concept to life in a self-animated – and visually delightful — new video for their rapid-fire rap track, "They.."
"When I made the track with [producer] Michael Beharie, I wanted to write a stream-of-consciousness rap — something that was channelling an inner dimension of myself, a dreamlike-state, like surrealist lyrics — so when I was creating the animation for the music vid, I wanted to extend that concept," Bunny Michael told The FADER. "I thought of memories and how they change over time with your own healing and growth. Each 'interior' of the video represents a memory both pleasant and traumatic and how my past continues to shape my life today. Even though the events of my past haven't changed, I have, so I see them differently. "My higher self was always there as the witness, the peace within the experience," they continued, "and I wanted the video to illustrate how we heal from our past by witnessing it in a new way — a 'higher' perspective that allows us to see how much stronger we are because of the pain we have been through." Watch the video above.